we manufacture high quality tamper indicating labels for warranty purpose. We perform in-house quality checks that employ stringent quality procedures at different stages of the production of products. We are involve in offering superior quality Void Stickers. These Void Stickers are made from high quality of raw material which ensure durability at its user end. Our Void Sticker can be customized as per our customers specifications and availed at most reasonable price. - Shriram Veritech manufactures different types of sealing labels that are used for brand protection and prevent tampering of goods. - These labels can be printed and / or be holographic as well. We are one of the reputed organization engaged in providing superior quality Void Label. 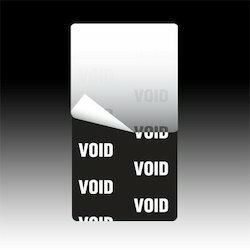 These Void Label are good demand in the market due to high quality and durability. These products are available in market at competitive rates. We are involved in offering a wide range of Void Security Labels to our most valued clients. Our range of Void Tamper Proof Security Hologram Labels is widely appreciated by our clients which are situated all round the nation. We offer our range of Void Tamper Proof Security Hologram Labels at most affordable prices. This label is used for carton closing, product sealing, in order to protect the seller from uanthourised tampering of the factory make. With our enriched industrial experience and knowledge, we are manufacturing and supplying our clients with a wide assortment of Void Label.